When looking at the conception of America as an exceptional nation, a paradigm shift has occurred from a core principle of egalitarianism to that of superiority. The US foreign policy (eg drone strikes, border security, NSA global surveillance) prioritises US interests to the detriment of other nations and marginalised communities with the unintended consequence of embedding the notion of superiority at home. This can be seen through the vilification of minority communities who are deemed unworthy to be considered American or uphold American values. Policies abroad have led to rising violence at home. Could a review before the UN human rights committee be the reminder the US government needs to protect the rights of all people? Such attacks are not isolated incidents. They are symptomatic of larger structural problems in the US, often fuelled by government policies, both foreign and domestic, that arouse suspicion and animosity towards specific minority communities. If the government is unable or unwilling to protect those most vulnerable, can international law, and the US’s upcoming review before the United Nations human rights committee remind us of our obligation to be “exceptional”? Political scientist, Seymour Martin Lipset, grounded this unique ideology of “American Exceptionalism” on two central principles: egalitarianism and individualism. We want to focus on the US government’s move away from the principle of egalitarianism and the human rights impact on vulnerable communities domestically, and ask, whether in the face of such violations, can we as Americans call ourselves “exceptional”? Many of the human rights concerns before the UN committee focus on violations directed at minority communities. A delegation of American NGOs will be travelling to Geneva to provide direct testimony to the committee on behalf of communities that have been surveilled, profiled, tortured, denied access to basic services, and have suffered from bias-motivated attacks to name just a few human rights violations. Many may react negatively to the notion of the US being reviewed by a UN body. But itis important to understand that 167 countries, including the US, voluntarily bound themselves to it. Many in the US believe they were not subject to international norms although the country has been the chief architect for numerous international human rights treaties. The US, like most other countries in the world, will have to answer for falling short of its commitment to uphold its human rights obligations. The review process is not meant to shame the American government, but to offer introspection into how we as a society can work to improve our human rights record. Take, for example, the recent Shadow Report on Hate Crimes submitted by theInternational Center for Advocates Against Discrimination (ICAAD). The report discusses how the collective trauma of 9/11 still persists and how triggering events (also known as “vicarious retribution”) make Muslims, Arabs, Sikhs, and south Asians susceptible to hate crimes more than a decade later. The report also focuses on bias-motivated violence against LGBT and Latino communities that are triggered by debates around marriage and immigration reform. In citing key data from federal government agencies, such as the FBI’s documenting of 7,713 victims of hate crimes versus the national crime victimisation survey (NCVS) which found an average of 259,000 victimisations per year from 2007-2011, the report is able to show the unconscionable variance in how government statistics have concealed the full scale of the problem, leaving policy makers, advocates, and law enforcement paralysed. In essence, the US captures just 3% of all hate crimes, 86.7% of all reporting agencies documented zero hate crimes in their jurisdiction, and 64 of those jurisdictions have a population of over 100,000 people. Combating hate crimes is further compromised by the mistrust between minority communities and law enforcement that has deepened by surveillance, profiling, and fear of deportation. Ultimately, the report furthers ICAAD’s mission to map system failures (gaps in the law) that perpetuate discrimination globally. This data-driven process seeks to find effective interventions for advocates and provides transparency and accountability for government compliance with international human rights norms. 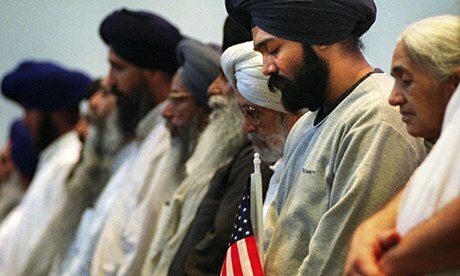 Crudely put, the current notion of American exceptionalism at home spreads the ideas that: Muslims, Arabs, Sikhs, and south Asians are not American (and are often terrorists), Blacks and Latinos are suspect (and unintelligent), and gays are going to hell(and before they do, they will destabilise the very foundation of American society). The question remains, will the review before the human rights committee make us reflect on the structural problems that reinforce discriminatory behaviour towards minority communities, or will we arrogantly shrug and refuse to grapple with the complex problems we face within? Ultimately, America’s compliance with human rights obligations will rest on how we begin to redefine or recapture the essence of American exceptionalism rooted in egalitarianism.